The course has been designed to utilise the natural terrain and althought the course is built on rising ground, the fairways traverse the hills, making the course a gentle climb. A track of almost 6,000 yds, Glenmalure is an 18 hole par 71 course, comprising 3 par 3's (one being 220 yds) and 2 par 5's. The design is much influenced by the Traditional Celtic courses of Scotland and Wales. Features include a double green, with many natural hazards, stone walls and ditches very much in play. Myself and a group of friends played Glenmalure in April 2010. The course was a real gem, with some of the trickiest greens we have ever played. We will be back again in 2011 as we found the surroundings breathtaking. Good course, in extremely good condition (Summer 2004). Although it is short in length it is extremely challenging for all golfers. Well worth around if you are in the area. Another advantage is the scenery, the views can't be beaten. I played this course a few weeks ago (July 2001), blessed with the weather I found this course fantastic. 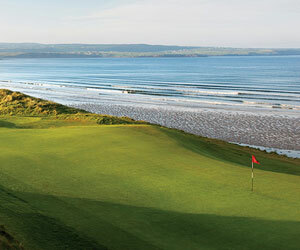 Not only was the course playing extremely well, the scenic beauty of this area of Ireland is stunning. This course is well worth the minuscule IEP£ 18 green fee, an absolute must to any golfer on a tight budget or not. If given the chance (and ever back in Ireland) Glenmaure will be top of my list of courses to play.